Lack of integration between goals, strategies and tactics is a problem I often find when reviewing online marketing strategies. This is true whether I'm reviewing student assignments or mentoring marketers creating real-world digital strategies. This happens simply because the different aspects of strategy often aren't well integrated because of the way the report is split up into separate sections. Although online marketing strategies are usually well structured, for example into PR Smith's SOSTAC® structure featured in our free online marketing strategy template, the sections aren't often well related. It's not clear how each strategy is supporting a goal or the analysis on which the objective is based. Here's a simple method to show alignment between objectives, KPIs and strategy which provides a one page summary of the digital strategy using a table that we feature in our member's Online Strategy Toolkit and explained in our guide to Delivering Results from Digital Marketing. I first created it working with clients and then featured it in the 4th 2009 edition of Digital Marketing: Strategy, Implementation and Practice book. It's in the 4th chapter if you have access to that! 1. SMARTER objectives i.e. 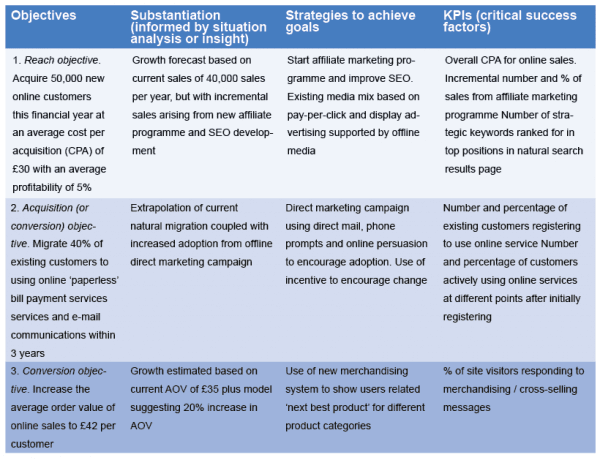 quantified objectives grouped around customer acquisition, conversion or retention or our RACE framework. 4. KPIs and CSFs. The Critical Success Factors are the detailed measures, for example those collected within Google Analytics which will help you review to prove you're on track or make adjustments. 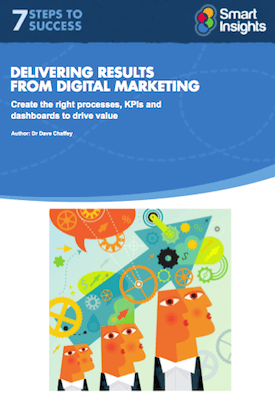 A manager's guide to defining KPIs and dashboards to manage and improve digital marketing Download our Delivering results from Digital Marketing Guide.